Barcelona is a city that is in constant connection with nature, not only because of its proximity to the sea, but also because of the various parks that, spread over the city, are responsible for giving it life. Some of these spaces of tranquility and nature are a little hidden. There are parks and gardens who deserve a full day visit and others are more simpler ones. In any case, they are excellent locations for an audiovisual project. We want to discover, with you, the most charming gardens in the city, spaces where you can breathe a special atmosphere or that contain pieces of art that are part of our history. Will you come with us? At the top of Montjuïc, between the MNAC and the Olympic Stadium, we find the gardens of Joan Maragall, that surround the Palauet Albéniz. It is an architectural ensemble in the French ‘chateau’ style, with the mansion in the middle and a paved strip, presided over by a large fountain with two lateral staircases, which is projected from the facade. To make your audiovisual production or photographic shooting here, you should know that the gardens are open on weekends and holidays from 11 a.m. to 3 p.m. The vegetation is based on geometric shapes and wild groves, among which white marble sculptures stand out.. 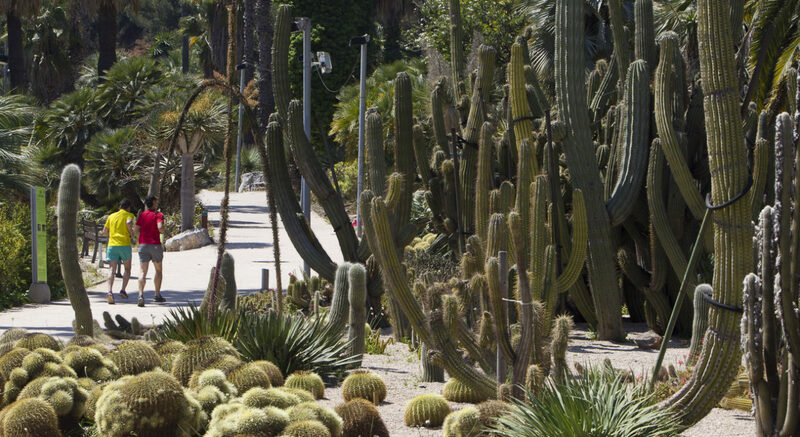 The Botanical Garden is divided into five landscapes, each with its own flora, but all with a Mediterranean climate. Each season modifies the mosaic of landscapes. 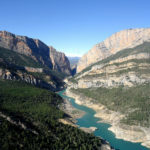 It is located in some old quarries behind the MNAC, where thanks to the shade and humidity of the place a sample of Eurosiberian flora grows. You can not miss this location in your next audiovisual project. 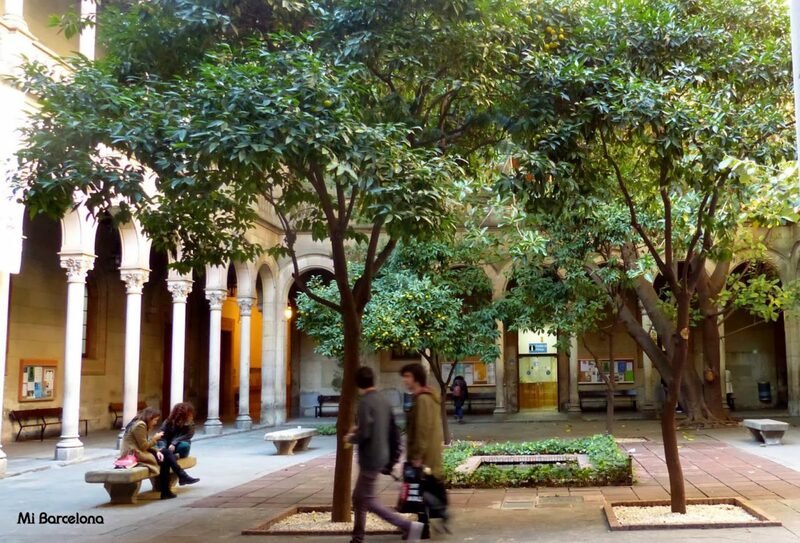 The historic building of the University of Barcelona preserves some lovely little gardens within its cloister and the whole back part. An oasis in the middle of the city that students can enjoy every day, and also those who want to walk through them. You can find here the ideal location for your photographic shooting or audiovisual production. The gardens count some 80 different species of plants, some adopted of the old botanical garden of Barcelona, and two ponds with fish and frogs. 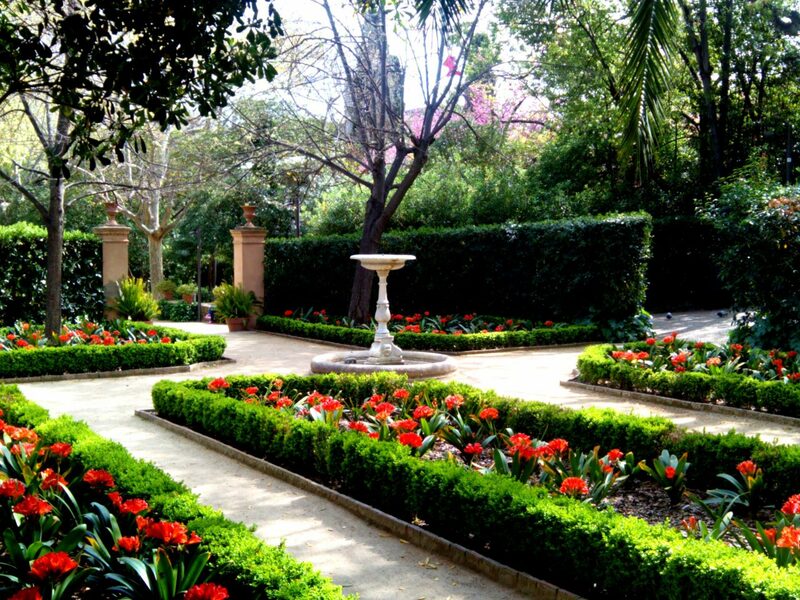 This green point of Sant Gervasi is a vestige of the gardens built by the bourgeoisie in the nineteenth century around their residences on the edge of the city. It has two faces, one squared and one more feral. Which one will you choose for your audiovisual project? The first is a classicist garden with fountains, sculptures, brambles and flowerbeds around the manor house, with a large fountain lined with moss and a centennial tree of 23 meters high. The second is an extension of grass and trees with an area for children’s games. Here the landscape sometimes looks like something out of a movie from the American Wild West. We will find here 800 species of cactus and other exotic plants. 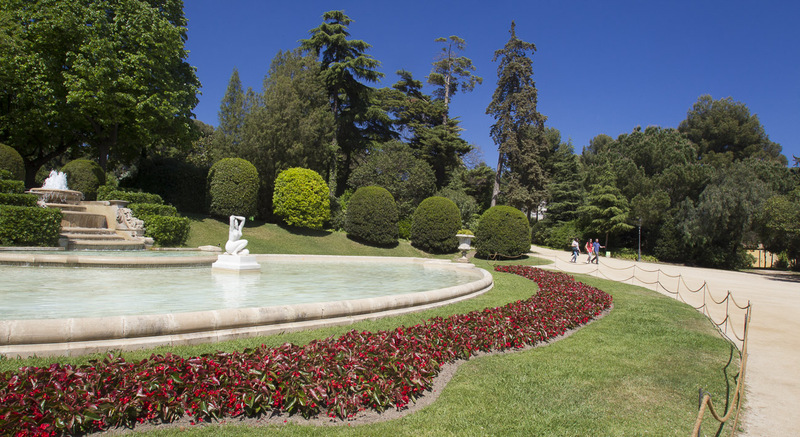 These gardens of 6.15 hectares have their own microclimate, as they are located in the southern part of Montjuïc where the sun touches them for many hours. A totally different location for your audiovisual production or photographic shooting. 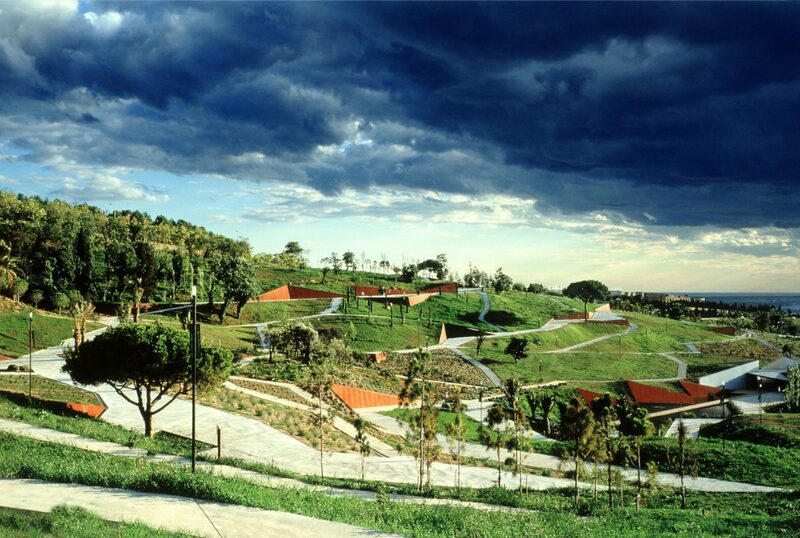 A large green space dotted by the colors of the flowers and trees, which extends up the mountain from the main entrance of Calle Miramar. In the highest part there are interconnected ponds where different species of amphibians and water plants live. 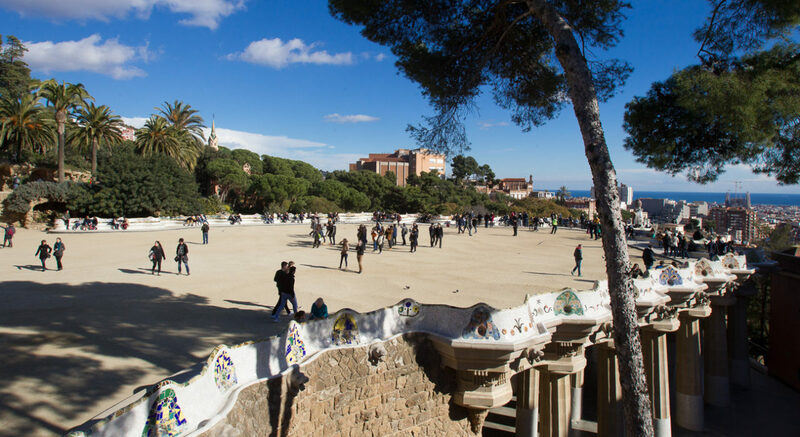 From above there are privileged views of the city and the sea, which together with the idyllic surroundings make these gardens one of the best in Barcelona to locate your audiovisual project. The Ciudadela Park is an important lung of the city. 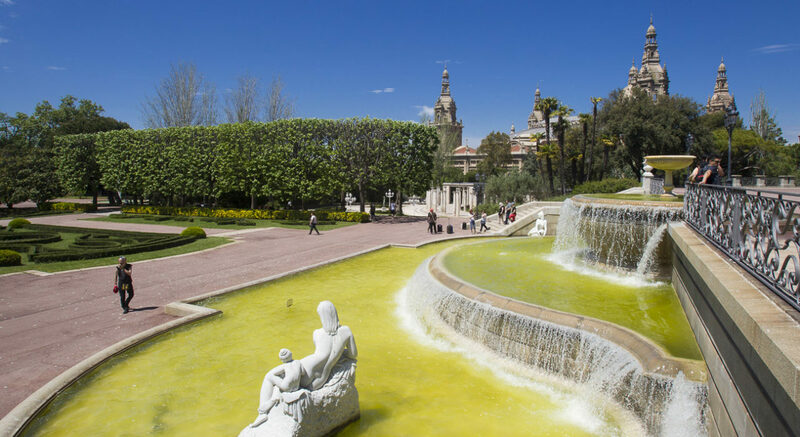 It is next to the Barcelona Zoo, and in this park you can enjoy a lot of corners, discover its fountain and Glorieta or take a boat trip. The little ones will love the Giant Mammoth. The Umbracle is a modernist building covered by a turn of five arches built with iron beams and brick pillars. The ceiling is a wooden slat that lets the light partially in to recreate the lighting of a rainforest. Under these conditions grow plant species from twenty countries, which are planted in rows between the corridors below each of the five arches. You will only have to choose which one is the best background for your photographic shooting or audiovisual production. They are the most stately of all. When crossing the great main entrance you will see a pond that marks a bifurcation. The two roads describe a turn on each side of the gardens until they meet again in front of the palace, but they are connected by a symmetrical matrix of small shady roads. If what you are looking for in your audiovisual project is the image of symmetry, this is your location. In the quiet and secluded district of Horta you will find this neoclassical garden, stepped on three terraces, for its palace with neo-Arab and neo-Gothic elements. 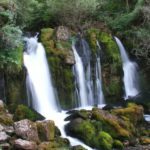 It is a romantic garden with flowerbeds, squares, large trees and a waterfall, plus a water channel between the terraces. 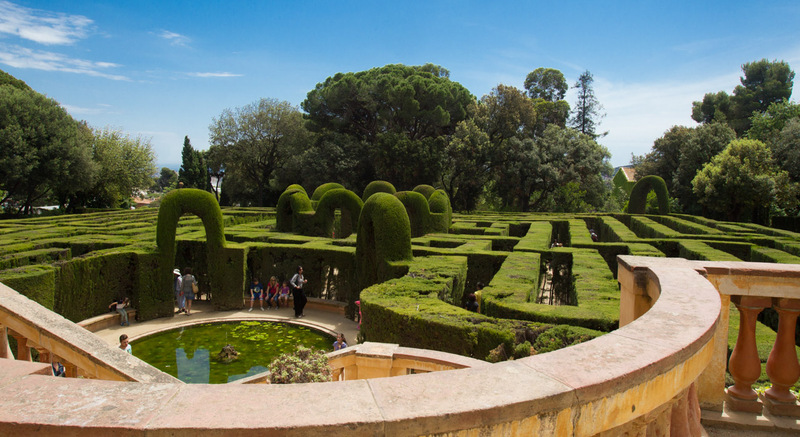 The park hides a wealth of sculptures, fountains, buildings and decorative forms of vegetation, combining themes and styles in a harmonious and stimulating set, in addition to its famous labyrinth. An ideal place for any photographic shooting or audiovisual production. 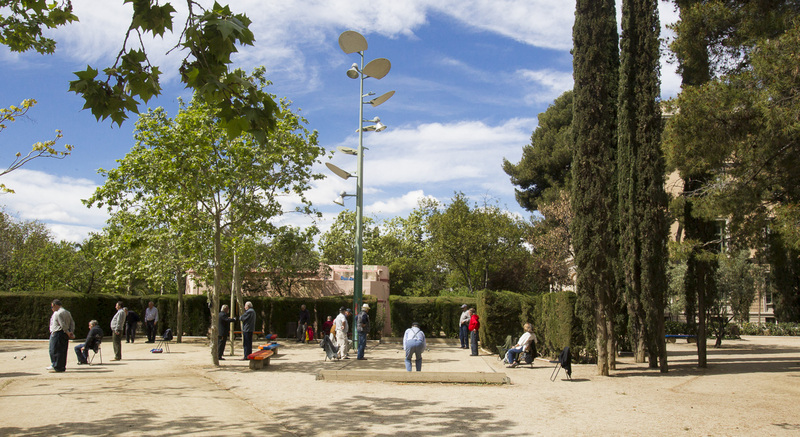 This park is located in the neighborhood of Pedralbes, right next to the university area. Here you will find some 11,000 roses in 245 different varieties for your audiovisual project. 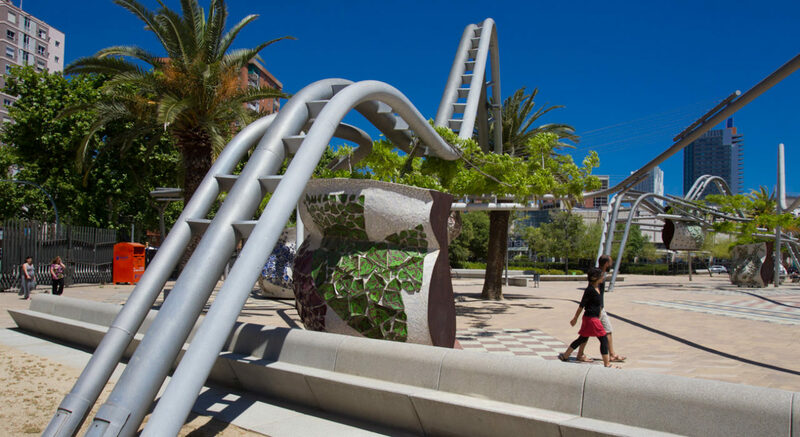 In addition, works of art such as the sculpture ‘Rombos twins’ by Andreu Alfaro and the ‘Adam’ by Jacinto Bustos. It has ping-pong tables and a children’s play area. The pérgola, covered with flowers and vegetation, reminiscent of a fairy tale, and is a must. 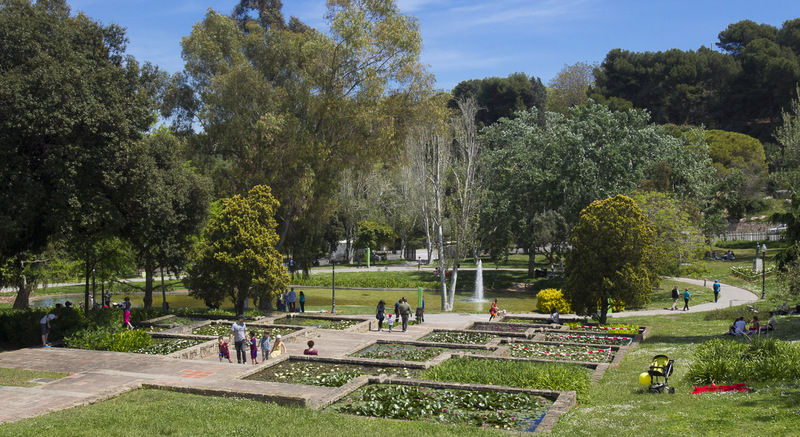 These two parks are located in the neighborhood of Sarriá. With exceptional gardens, a free playroom for the little ones, a cement court to play basketball, and ping pong tables. Perfect also for riding a bicycle, a scooter or playing in separate playgrounds designed for different ages. Choose which one adapts to the needs of your audiovisual production or photographic shooting. Perhaps it is one of the most original parks in the city. In the middle of Diagonal Mar you will find a space whose giant slides are the main attraction for children and adults. A fresh and different image to locate your audiovisual project. 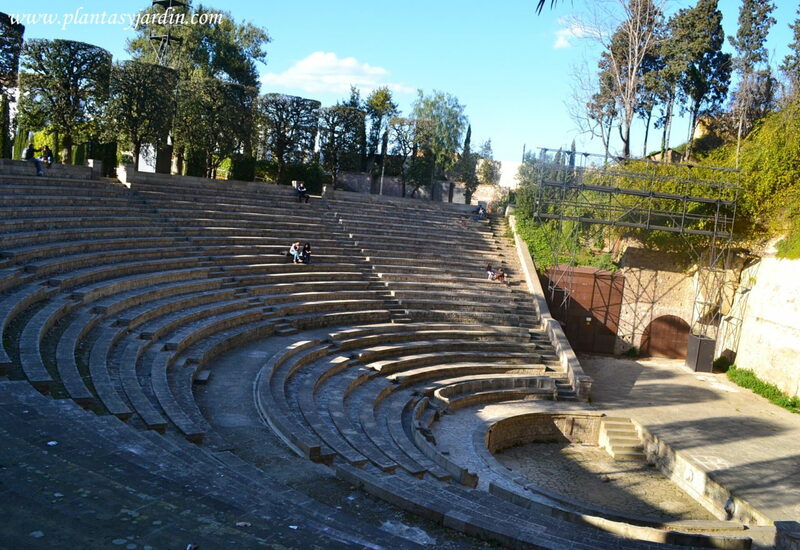 The Teatre Grec Gardens are the great discovery of the city. 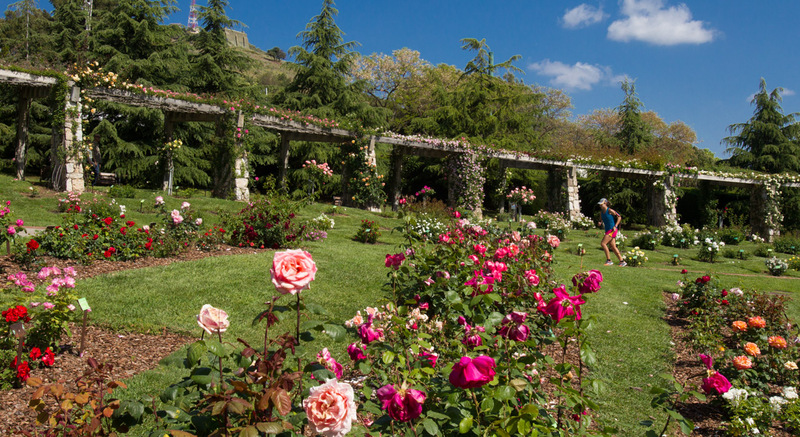 The amphitheater, the viewpoint, its central garden, its flowers, and its unbeatable views of the city. Perfect for a photographic shooting or audiovisual production with the best background.